It used to be so simple; chopping boards were no-nonsense lumps of wood. Now, we can buy marble/granite, toughened glass, multi-coloured polyethylene, synthetic rubber and different types of wooden boards in all colours, shapes and sizes. When choosing chopping boards avoid being seduced by the packaging and quirky presentation-your boards have work to do! Chopping boards made from English oak are durable and attractive. They can be bought with a central area of ‘raised wooden teeth’ to grip joints of meat as you carve and may also have a sort of moat around the edge to collect the juices. Or, they can be plain and simple (but still strong and practical) like the traditional wooden butcher’s blocks. Maple, beech and even bamboo wood are also used to make chopping boards. If you like wood in your kitchen there is bound to be a block suitable for you! Handle a board before you buy it; does it have finger grips? Will it slip easily on the kitchen worktop? Large boards are easier to work on than small ones but wood does need to be kept oiled-to prevent it from absorbing moisture-and so last longer. Wooden chopping boards will need to be washed by hand. Marble and granite are not new to the kitchen-cooks have used them for years, especially for rolling pastry, because they provide a cool surface on which to work. These can be more expensive than other chopping boards but are strong and look good. Marble slabs work well as cheese boards, too. This type of board will probably have non-slip feet on its base so will only be used on one side. Polyethylene is a popular material for kitchen boards because it does not absorb stains or odours. These boards can generally dishwasher-safe and the use of colour-coded boards helps to prevent cross-contamination of foods. For example, you could use a red board for raw meat, green board for vegetables, white board for onions/leeks/garlic, a blue one for fish, and so on. These colour-coded chopping boards can be very useful if you have one family member with food allergies; like coeliac disease. Polyethylene is tough and long-lasting but can blunt your knives. They are sold in different thicknesses and lengths. Some really thin ones can even be rolled up to transfer food from worktop to pot without spills. Toughened glass may be considered suitable for all foods and easy to clean (although it is hand-wash only)but should have non-slip feet that do not make moving the board difficult and therefore dangerous. Most of the chopping boards mentioned can be bought as simple boards or paddle-shaped, animal shaped, fruit and vegetable-shaped, patterned, multi-coloured or plain. The purchase, storage, cleaning and use of knives should be taken seriously. Buy the best you can afford and store them in a knife block (preferably) purpose-designed knife wrap or secure magnetic wall-mounted knife strip. Sharp knives should never be kept loose in a drawer! First of all, decide what you need. Budget cost knives may be an acceptable choice if you do not spend a lot of the time in the kitchen. However, if you intend to cook and prepare food on a regular basis, it is worth paying extra to buy quality knives that will last for years. The higher quality knives are made of harder steel so cut more easily, stay sharper for longer, cope better with prolonged hard use and more frequent washing/sharpening. They tend to be better balanced and therefore easier to hold and use. Knives are simple to clean-best washed separately. Stainless steel blades are conventionally used in kitchen knives but other materials, such as titanium, molybdenum, high-carbon steel and zirconium are also in production. Handles can be moulded and ergonomic to prevent hands from getting tired. Dotted steel handles, seamless blade- to-handle knives, diamond blasted steel handles, bamboo, brass riveted and various other designs are available. Handles should be secure, safe and comfortable to hold. The rest is a matter of personal preference! Blunt knives can be more dangerous to handle than sharp knives. 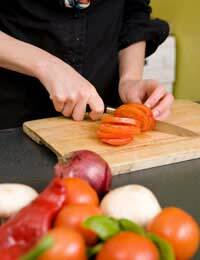 For safe, efficient cutting, it is important that kitchen knives are kept sharp. A sharpening steel may be sold as part of a carving knife set, or whetstones can be bought from good kitchenware stores. Read the instructions! Sharp knives are easier and safer to work with. Using different chopping boards for different things is a great idea, as it prevents any cross-contamination and lessens the possibility of salmonella from mixing raw meat and other things. It’s more of a pain to wash later, but even then it’s just a matter of a few seconds, which is less important than yourfamily’s health. The problem with cheap knives is that they just don't cut as well as more expensive ones, and won't retain an edge even after being sharpened (they pretty much need to be sharpened every time to be fully effective). So, instead of saving money up front, it's actually cheaper in the long term to have perhaps two really good knives that can last a lifetime and then add to that collection if you feel it's necessary. Most people can comfortably get by with three good knives.